For the first time since 2011, this traditional Eastern hockey superpower needed a road upset to advance to the Hockey East semifinals at the Garden, something many Eagles fans felt is their birthright. Unlike past teams, however, York’s 2018-19 Eagles had lost an astounding 21 games, and most pundits thought their elimination was a foregone conclusion. Not York. York has embraced his new role of Riverboat gambler, and he’s holding a pair of aces. Ace No. 1 is former NTDP scoring star Logan Hutsko, a kid who was mired in a sophomore slump until he ruined the Friars’ season with consecutive game-winning daggers. “Rookie of the year last year,” said York, who conceded that Hutsko had hit “a brick wall this year.” The veteran coach is accustomed to the best offensive talent in the nation year after year, and is convinced he has a phenom on his hands in Hutsko. Armed with a goaltender on a mission and a sniper who’s found his stride, York’s Eagles march into Boston Garden with a truckload of house money. They’ve got to win a pair of games, starting with the powerful Minutemen, to extend their Cinderella run. York, however, doesn’t see it that way. The consummate educator gave his charges a lesson on hockey probability. York then recited his players’ answer, how they calculated the required path of victories to get to the Garden, into the NCAA’s, and then all the way to Buffalo. His season was toast after the Beanpot, the losses—and the injuries—piling up. But the Eagles now return to the familiar ice of Boston Garden, having left national contender Providence in their wake. 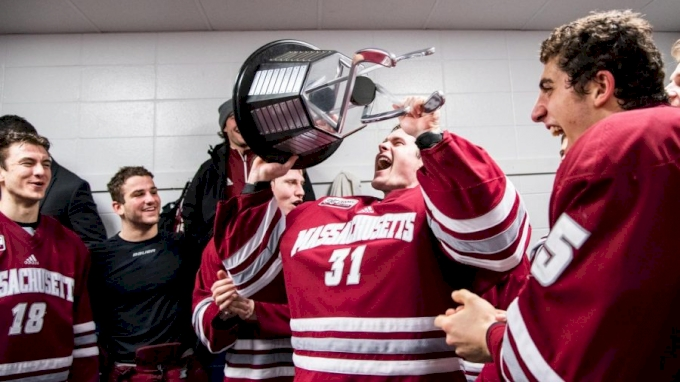 Powerhouse UMass stands in the way of the BC’s most improbable NCAA run ever, but as York told his troops, it’s only one game. Author Tim Rappleye just released his latest book: Hobey Baker, Upon Further Review (Mission Point Press, 2018). He can be reached on Twitter @TeeRaps.